Do You Feel Alone in Advocating for Your Customer? I met with a project team to discuss a new retail system for their company website. Their current system was simple, easy to use, and they had received good feedback from the customers who used it. However, it was not fully integrated with their processes and they planned to replace it with a new system that would improve their internal workflow. My job was to provide the project team with the results of customer testing of this new system. Sadly, I had to deliver some tough news. During the tests, the new system failed on several points. These points ranged from inconsistent and confusing labeling, redundant steps, an unreliable search routine, to an unusually high occurrence of errors that could halt the checkout process. From customer’s viewpoint, this was a tough system to use! I thought my report would come as a complete surprise. However, the shock was mine when the business stakeholders (the team who benefited from the automation of the new system), said they already knew about these issues! They had decided to continue with the rollout in spite of the poor experience the system provided. They insisted that it was a “wonderful system”. They felt, in fact, that the concerns I identified were “out-of-scope” for the roll-out. 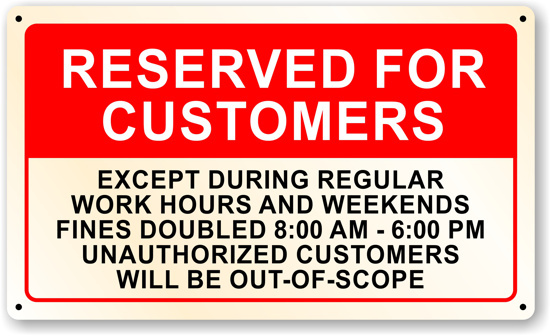 The customer is out-of scope? From their viewpoint, the new system was “good enough” to roll out and customers would “be happy” using it simply because the internal stakeholders would have a better process. We were at an impasse – and I stood alone in representing the customer. I had entered this meeting wearing my soft, fuzzy customer hat, advocating for beloved customers. I soon found that I had to exchange this hat for a helmet, because I was hitting my head against a brick wall! Customers don’t know about your internal processes. Customers don’t care about your internal processes. Customer shouldn’t have to know or care about your internal processes. Customers do care that it’s easy to do business with you. If you think this situation is rare, think again. When an organization’s culture is NOT putting their customers first, NOT focusing on their customers, NOT trying to make their customers successful, then this same scenario happens over and over again. This may be happening in project meetings throughout your own company. When the culture of an organization isn’t centered on their customers, decisions are not made on their behalf. Poor decisions in customer experience cut into your bottom line, in more ways than one. It all starts with the heart of your company – your people. From the book, Happy R.A.V.I.N.G. Customers! 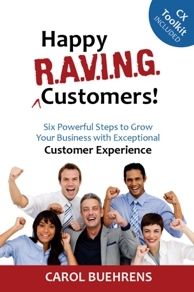 Six Powerful Steps to Grow Your Business with Exceptional Customer Experience, by Carol Buehrens.